The renewed HUFS emblem is of a more modern style but retains its familiarity from the previous design. It is generally round and symbolizes the spirit of a HUFS student standing tall at the center of the world. The Korean initials “o” and “ㄷ” are basic elements and are designed graphically. The longitudes and latitudes of the earth express HUFS’s firm commitment to globalization. The bluish-green (Pantone 315C) represents future, life, growth, hope, and other such uplifting things, and the following grid system must be complied with. This symbol is the most important element in the HUFS image integration effort. It must be used according to the item-specific rules: it cannot be modified arbitrarily. The emblem consists of three components: Minerva, the owl, and the globe. At the center stands Minerva, the Roman goddess of wisdom. She is also known as Athena in the Greek mythology as goddess of wisdom and crafts. Next to the goddess lies the famous owl of Minerva, a sacred bird which also represents wisdom. In addition to the goddess and her little companion, the last component of the HUFS emblem is the globe, to represent the insights and intelligence of HUFS in resolving global challenges and shaping the future. 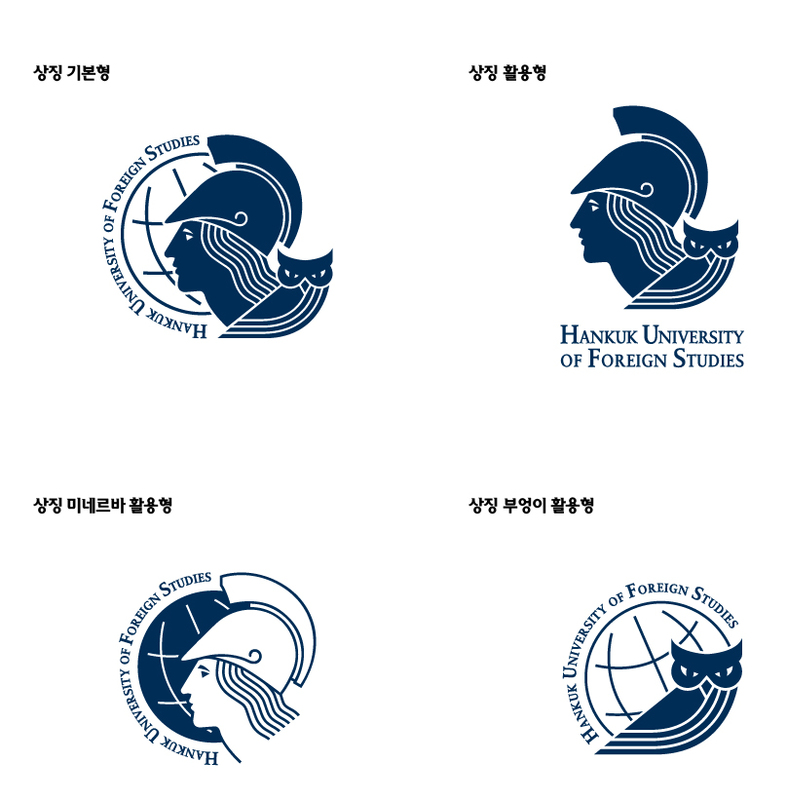 The emblem represents "HUFS Vision 2020," aspiring to become a world-class global university based on academic convergence. The emblem will be used widely along with other symbols and logos to project the unique image of HUFS.